A bubbly, high-energy foodie who started her broadcast career while serving in the Air Force, Sunny Anderson lives up to her first name. She's become a favorite host of several shows on the Food Network, and has done it all while living with ulcerative colitis, one form of inflammatory bowel disease (IBD). 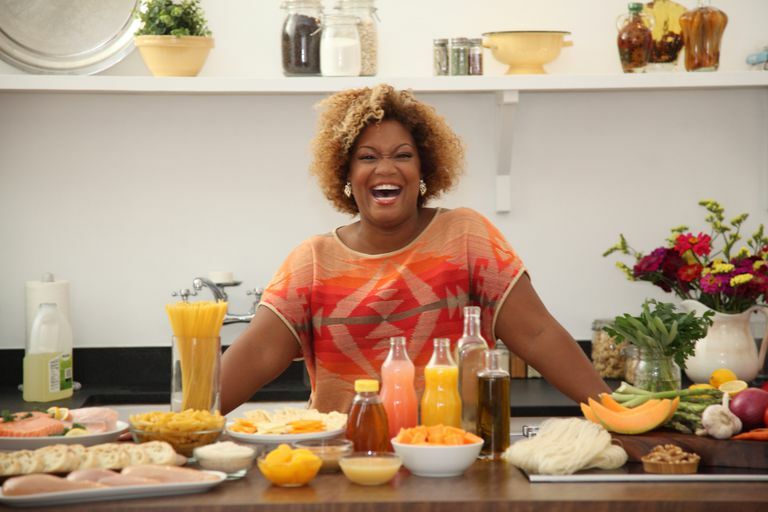 Sunny Anderson's love of food began at an early age and was nurtured by her parents, with whom she traveled the world while her father was in the Army. Her family has a long history in the United States military, with her father serving in Vietnam and her grandfather serving in World War II. She picked up international influences from the various places she lived around the globe, which show up frequently in her recipes. What makes her stand out is that she often melds her love of international flavors with American staples. After graduating high school in San Antonio, Texas, Sunny enlisted in the Air Force. While serving she was stationed in Seoul, South Korea, where she began her broadcasting career on the radio. Upon returning to the U.S., she continued as a reporter, host, and producer for the Air Force News Agency back in San Antonio. After leaving the Air Force, she continued to work in radio across the United States, including stations in San Antonio, Fort Polk, Louisiana, Montgomery, Alabama, and Detroit, Michigan. Radio was her day job, but she had a second gig running a catering business, Sunny's Delicious Dishes. What started as cooking for herself and her friends and grew into a thriving business, catering for media events. A guest spot on Emeril Live propelled her from radio into TV. Sunny has appeared in several shows on the Food Network and the Cooking Channel, including How'd That Get On My Plate?, Gotta Get It, Cooking for Real, and The Kitchen. She also appears regularly on The Rachael Ray Show and is a food writer for Oprah's O Magazine. What Sunny kept to herself for 20 years is that all that time, since she was serving in the Air Force in fact, she was living with ulcerative colitis. She did tell a select few about her IBD, including people she worked closely with in radio and TV, because she found it to be a necessity at times. As a disc jockey, Sunny would have had a difficult time if she were having a flare-up and needed to leave the sound booth when she needed to be live on the radio. "You tell a couple of co-workers, especially when it's the urgency to go, and you're in radio and you've only got a 3 minute song. You gotta figure out what you're going to do when the song starts ramping out," Sunny said. However, the general public was never aware of her condition, or that while she was cooking up food and fun in the kitchen, she might have to restrict her own diet carefully. Sunny began to feel very strongly that as a celebrity chef, she had a responsibility to bring awareness about IBD to the general public. Because she is so well-known, she was often approached not only to endorse products, but also to be a champion for various nonprofits. Sunny put out the word with her staff that she was interested in doing something in connection for the disease that she actually has — ulcerative colitis. "I have ulcerative colitis. I feel like people don't know about it. I'm constantly educating people on it, on a one by one basis," she said. The opportunity to bring IBD into a bigger arena came in the form of a diet and nutrition web site for people who have IBD, in conjunction with the Crohn's and Colitis Foundation and Janssen Biotech, Inc. The Get Your Full Course web site provides basic information on Crohn's disease and ulcerative colitis, nutrition information and the thing that Sunny is most famous for: recipes. Sunny now lives in Brooklyn, New York, where she resides with her many rescue cats.